The iPhone 5s took the top spot at all major U.S. carriers in September and the iPhone 5c followed closely behind, reports Canaccord. "Our September surveys indicated very strong initial sales and back orders for the iPhone 5s and strong iPhone 5c sales at the four tier-1 U.S. carriers and also in international markets," said analyst T. Michael Walkley. 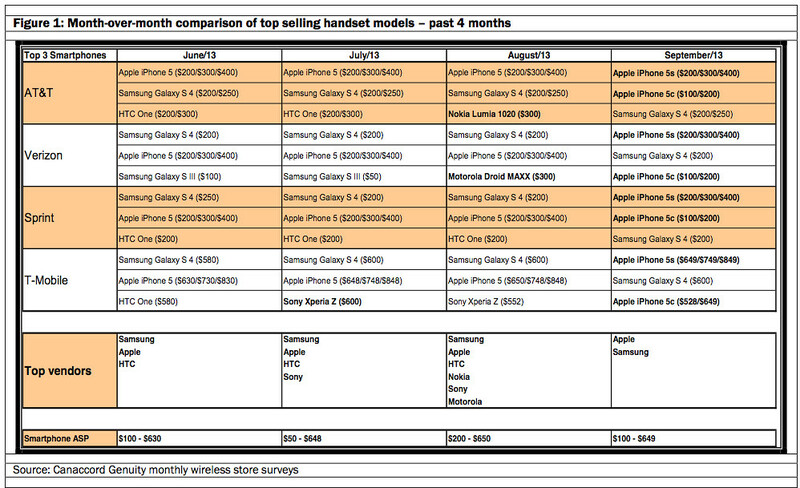 The iPhone 5s was the top selling device at AT&T, Verizon, Sprint, and T-Mobile in September. The iPhone 5c was the second most popular device at AT&T and Sprint and the third most popular device at Verizon and T-Mobile. It was the Galaxy S4 that outsold the iPhone 5c at Verizon and T-Mobile. "We believe these price cuts combined with Samsung's aggressive marketing and effective advertising campaign for its existing and new high-tier smartphones, such as the recently-launched Galaxy Note 3, could potentially help Samsung reduce high-tier smartphone share losses to Apple in October despite the strong iPhone 5s and 5c demand."